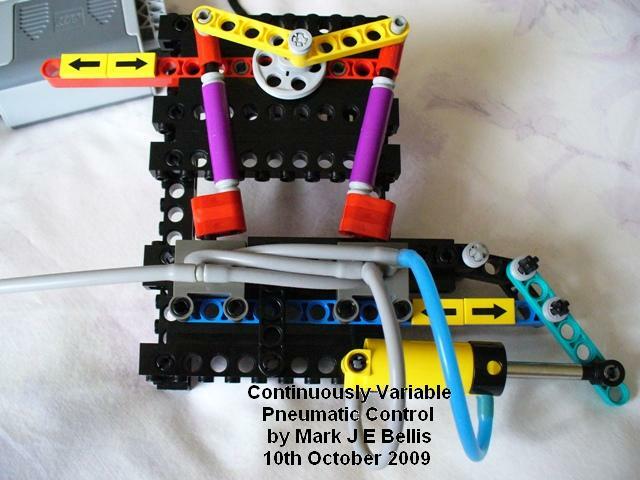 Mark Bellis is one of the few gurus in LEGO pneumatics whose work I've crossed with (not to mention any other areas of technical knowledge). He has some fascinating work done on LEGO pneumatic building blocks that simulate logical and other functions. Since it is not a trivial idea, neither easy to put in practice or to understand, he also decided to make a video tutorial explaining how it works. "A revolutionary development for LEGO pneumatics, opening the door to proportional control and providing a way for LEGO pneumatics to compete with the Linear Actuator found in recent sets. " as he own wrote in the respective video description at YouTube. You may find some photos and detailed description about this block at Mark's BS folder, or even a lot of his other ideas for pneumatics in the folders one level above. Great idea to control by feedback loop ! The output will have a little ripple but it is not crucial, I think, compared to the main purpose. I'm quire impressed. Amazing stuff! A wholly mechanical system that provides position control to a mechanism whose only controllability is acceleration... ingenious! I wouldn't be surprised if LEGO faced this problem too, and it's interesting to see they solved it in a completely different manner: with the now well-known Linear Actuator. Given the complexity required for the pneumatic feedback system, in applications where precise position control is important, personally I'll prefer to use LA's and try to route their mechanical inputs with gears and U-joints. Nonetheless, this is a really good concept with its applications, and proves that it is possible to have precision with LEGO pneumatics. Yea, pneumatics sure are cumbersome, but the sheer mechanical geekery behind this is genius! I've also tested the mechanism with a small cylinder replacing the normal one. It's more jumpy, especially if the air supply is from a hand pump (applied all at once, so all at one part of the dither crank revolution and therefore all to one side of the cylinder), but it works OK. Better if the hand pump makes smaller oscillations to supply air smoothly. I then made a pair of mechanisms and laid them out like a steam engine, driven by small cylinders and with 6 wheels behind, lowering the red beam but making a vertical extension for the dither crank. The dither cranks are fed from one motor via belts (which allow the supporting beams to slide relative to one another whilst maintaining drive). I fed the valve gear cranks back to the red beams, using gears and brackets to vary the timing by +/-20 degrees or so, which was enough to get the steam engine to go each way as air was supplied. One aim was to see if low speed control is better. Maybe it would be with the normal size cylinders but the small ones would fit better in a train to run on L-gauge tracks. There are better, more efficient steam engines but the principle works. I should look into the real control functions a bit more in order to optimise performance. Maybe then I'll post pictures of it. A further aim is to shrink it to fit a normal train profile, to run on L-gauge track with BBB or Emerald Night wheels, but it's quite large at the moment! I've thought about trying the mechanism on the 8421 crane (where the mechanism should maintain crane jib position under varying load, up to the supplied air pressure). I also thought also about making a platform a bit like a ride-in flight simulator from an arcade, with at least 3 mechanisms. More lifelike robotic movements are also possible. I just found this. Wow! I am not an engineer but I have an enthusiasm for steam power engineering. I have built a working Walschaerts radial gear that runs very well using a vacuum. It runs its own compressor which can be disengaged when enough presser is built. Air is stored in a reservoir. A Pneumatic switch is then used to control two small rams which move the lift arms of the radius rod. Unfortunately Lego pneumatics have only allowed for full forward or reverse positions where as by hand I can run the engine in any position, even neutral. This system may be effective for controlling the position of the lift arms. I also have a Baker expansion gear. All is 100% unmodified Lego and I look to trying your idea on both! Putting more air line or a reservoir between your pump and the small cylinders might help make the system less jumpy, but will likely effect the precision. Maybe, there is a healthy balance. This is amazing! Thank you for sharing this.